quintagroup.dropdownmenu package allows to create and manage multilevel portal drop down menu on Plone sites. 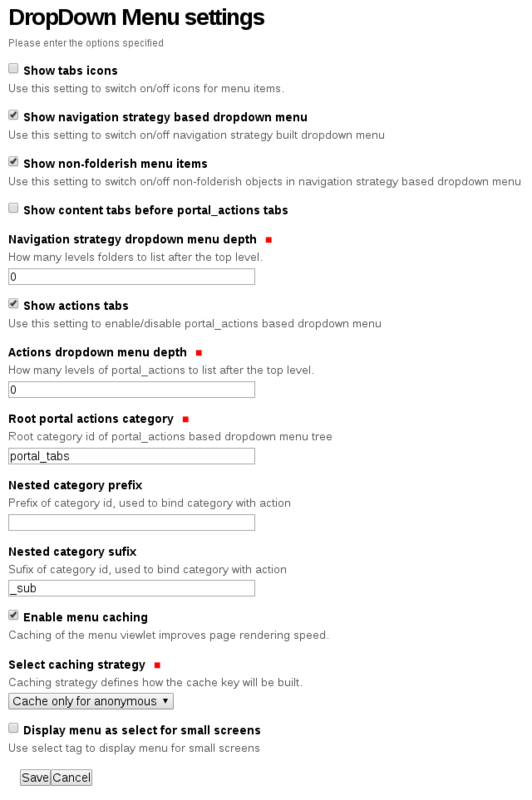 quintagroup.dropdownmenu package allows creating and managing multilevel portal dropdown menu for Plone sites. Then re-run buildout and restart Zope instance. Activate Plone Drop-Down Menu via Quickinstaller in Plone: Site Setup -> Add-ons. To enable mobile navigation you need to tick the box for Display menu as select for small screens. Add CMFActions to represent navigation first-level items (example ids: folder1, folder2) and CMF Action Categories to include second-level navigation items (example ids: folder1_sub, folder2_sub). Each CMF Action Category will include CMFActions - 2nd-level navigation items and may include CMF Action Categories - containers for 3-rd navigation level (if needed). You can change items order by using Up/Down buttons. See illustrated usage how-to in the quintagroup.dropdownmenu documentation Usage section.